Nicknames evolve, ’round here. For a long time Monkey was most often called Small Boy and then one day he pointed out that he was no longer small, Mom, GEEZ, so Otto started calling him Medium Boy. And there was that whole thing where Chickie changed her nickname to Pork Rind on my phone for reasons which were unclear to me. Somehow—do not ask me to explain, because I cannot—of late she has become Flerp Derp. This started as a random nickname and has become a whole THING, like, with a life of its own. Are you familiar with the Narwhals song (mildly NSFW)? There is a Flerp Derp song, now, set to the same music. It’s a thing. Naturally, she is now in my phone as Flerp Derp. I understand that there is some conflict about the term “derp” or “derpy” in some circles, and I don’t know if I can make a compelling argument for adding “Flerp” rendering it offense-neutral, but this is what the child does. She calls herself Flerp Derp. Regales me with LOUD and FREQUENT versions of the Flerp Derp Song (“SWIMMING IN THE OCEAN! 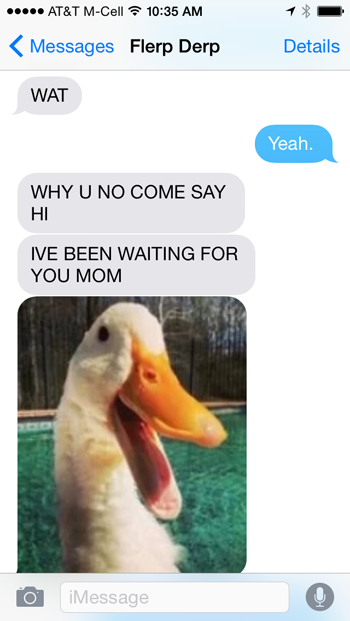 BECAUSE I AM SO AWESOME!”) And then one day she texted me a picture of a delighted duck with only the message FLERP DERP! This duck has become a catch-all of emotion. Surprised? Flerp Derp duck. Happy? Flerp Derp duck. Just want some attention? OH HI FLERP DERP DUCK! So text exchanges such as the one below are not at all unusual for us. When we upgraded to The Grand And Gratifying Glory Of Everyone Having iPhones Finally, I added Life360 to all of our phones so that I could keep better track of the kids and their various comings and goings without having to text them “Are you on your way home?” and such. (I have no affiliation with this company whatsoever, I just downloaded the program on a recommendation and it’s been working pretty well for us so far.) Basically it allows you to see everyone on a map, set up alerts for certain locations and comings/goings, and contact everyone quickly if you so desire. I set up a family circle and sent invitations to the kids and Otto, and then all they had to do was accept the invitations and set their names and profile pictures. I picked a sort of ridiculous pic of myself (I thought, wouldn’t it be nice if every time the kids opened this app they saw me making angry eyebrows? JUST LIKE HOME! ), which was followed by one of Monkey wearing his new Cthulhu hat, and Otto using a picture that is 98% Duncan and 2% him. Both Monkey and Otto used their actual names, though. Chickadee, on the other hand (and why I didn’t anticipate this, I have no idea), not only used the duck as her profile picture, she set her name as Flerp Derp, and when she discovered that would only display FLERP, changed it to Flerp-Derp. Because of course she did. Sadly, the display is only large enough to now display it as Flerp-D, which I think is probably her rapper name. My new favorite thing is opening up the app when she’s headed out and watching my deranged little duck sail down the road. I don’t know how long she’ll be Flerp Derp or who (or what) she’ll be next, but I can tell you that it’s never, ever dull at our place. « But what about his royal Monkeyness? My daughter started using the word derp a couple years ago. Then it became derp-a-derp and I had no idea what it meant (proving that I am old and out of touch these days). It delights me to no end to know that my children are not the only ones using this word in a goofy manner. Oh my god. Laughing so hard. I’m probably the same age as you, but can you adopt me?? Your pic totally reminds me of angry eyes from the Tintin cartoons. Those always freaked me out a little when I was younger. Also, that duck is adorable and I may feel a little choked up at the thought of a duck getting a prosthetic leg and being happy. It’s an emotional day. It’s good to know that other families enjoy nicknames as much as mine. There were eight of us in the house when I was a child and no one ever got called by their given name. A random sampling from over the years (without revealing my personal designations): Buzzy, Wuzzy, Wuzzle, Boy, BoyChick, Small Fry, Fartso, Wormsical, Mimmus Poleglotus, Popsy Poopsy, Dudette, Ilillibuff, Blatty, and Vern. This paragraph from the Pork Rind post, I very much needed it today. Thanks. Non sequitur, but I really covet Monkey’s hat. My kid has a dreaded Herbst Appliance as part of her orthodontic regime, which she has come to call her “Herp-Derp Appliance,” and which I will now and forever equate with a duck. It’s probably really going to make her mad that I smirk while she’s complaining about it. Whaaat? I thought you were on the cutting edge/early adopter of Kind Of Odd Celebrity Baby Names. Before Apple and Kal-El, there was Chickadee and Monkey (although I really think it should be spelled Monkee because then the names would match & that would be too, too precious). 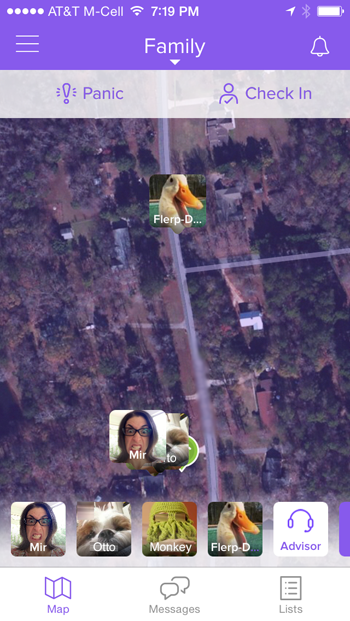 The pics everyone chose for Life360 are pretty awesome. Our official dopplegangers are still Bean and Moo for our two but I realize we have been though a wide number of variations and totally unrelated names. Poochie is a favorite right now. Last night I dreamed that you and I were on some sort of quest, not really sure what, except my teeth kept falling out and we had to take your kids everywhere. This would have been fine, except Chickie and Monkey kept alternating between being very small children and…goldfish in tanks. Either way, you never saw their faces. I have no idea what’s wrong with my brain. I love nicknames. I have Toots, Squirt Girl and Butch in my house :). Or Big One, Squirt, and Junior Dude depending on the day. My dad wasn’t so kind. Us kids were weenienose, shithead, and moron 1 and 2. I believe I was both shithead and moron 1 at different times. (My ex-husband was moron 2.) I was such a good kid…NOT. Kano, Mikester, Bean and Ice here. I DID NOT KNOW ABOUT THAT APP!!!!!!!!!! !… FOR ALL THE YEARS I’VE HAD TEENAGERS!!!!? ?….